We have grandiose plans of seeing all of Tuscany. Will it happen? It remains to be seen. It is certainly (certa) a good goal, nestled somewhere between settling into routine life in Florence---with school, soccer, and regular walks to food markets and espresso bars---and running all over to see everything. We have been busier settling into school and soccer and our new apartment than we have been looking outward at the Tuscan hillsides. Though we did steal away to Fiesole for a day. And this past weekend grabbed the train to Sienna for an overnight. A quaint hill town, Sienna is very well-kept and picturesque, with just a handful of must-see landmarks. 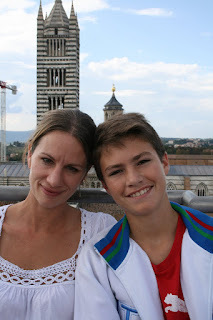 We hopped into the Duomo of Sienna and around the Piazza del Campo, climbed tiny circular stairs up the to-be second facade of the church (there were plans to double the size of the church, and archways and museums highlighting the enormity of their goal). And we ran into friends. How shocking to hear someone say your name, while traveling in a foreign country. A friend I had not seen---but had been very fond of---since graduate school (marriage & family therapy), was there celebrating an anniversary with her husband. And there we all were; so we grabbed a bottle of wine under an awning overlooking the plaza and carved out some time to catch up. Great to see you Layna! Other highlights from Sienna: all the hanging laundry out the windows made for great photos, one very delicious meal (in contrast to one very non-delicious meal), and my first purchase of Tuscan pottery: a sangria pitcher (store link www.sangiovannistyle.it). Plus, we were intrigued with all the symbols for neighborhoods (Sienna is known, historically, for its strong neighborhoods): street lamps ran up and down streets, and were painted specific to the color codes and detail of each neighborhood. Info: the great restaurant was La Taverna di Cecco. Skip the risotto but hail to the polenta, veal scallopini, cheese plate, wine... and ambiance. We had dinner there, then went back for lunch the next day. After a summer of lots-of-eating-out, we have learned that when you find a gem, stick to it. So we did. I'll never forget walking through some narrow alley as it opened up onto the Piazza del Campo. There's something so amazing about the way the Piazza feels surrounded by the Tuscan colors. And isn't amazing how small the world can be. I had the same thing happen in Granada Spain with Heidi Denhem (Kamps) about 7 years ago. Crazy.